Dr Goldstein pictured with the Cook team (l-r) Anna Campo, Ana Lozano, Andrea Haynes, Patricia Rollan, and Laura Robinson at ISUOG 2014. In September, the Reproductive Health team attended the 24th World Congress on Ultrasound in Obstetrics and Gynecology in Barcelona, Spain (ISUOG). The congress recorded over 3000 registered professionals who travelled to Barcelona not just from all over Spain, but also from South America, and even Asia. It was a particularly special meeting for our team as we were visited by Dr Stephen Goldstein, co-inventor of the Cook Goldstein SonoBiopsy™ Catheter. 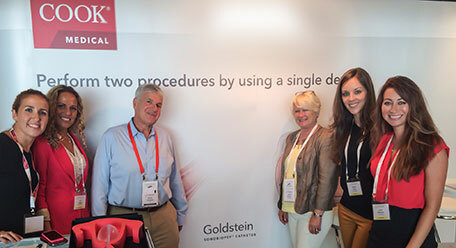 Having Dr Goldstein at the stand was a wonderful opportunity for our sales representatives and our customers to discuss in detail the latest advances in ultrasound technology and its use in their practice as obstetricians and gynecologists. At Cook, we understand the importance of continuing to identify ways to meet patient needs through more minimally invasive procedures. Ultrasound technology is an incredibly important part of this process as it continues to evolve, and is relatively inexpensive and convenient.